Services revealed at the event were "materially different than we had anticipated," said Goldman Sachs' Rod Hall. He noted that Apple TV+ has a broad "fall" launch date with no pricing, and the same can be said for its App Store gaming subscription, Apple Arcade. Likewise there was no word of a rumored Amazon Prime-style bundle, though Hall noted that Apple might simply be waiting until all its services are ready. "Though all of these services are interesting from a platform churn point of view none seem likely on our calculations to materially impact EPS [earnings per share] in the short term, with the possible exception of Apple Arcade pending pricing and service details," he continued. "With small calculated impacts from these 'Other services,' we expect the focus to return to the slowing iPhone business post this event," he concluded. The analyst's memo didn't make mention of the Apple Card, presumably because of foreknowledge and/or possible conflicts of interest. Oppenheimer's Andrew Uerkwitz suggested that the new services — Apple Card included — "provide better solutions to solve relatively niche problems in media business," and that they "may prompt existing iOS users to stay more invested in Apple's ecosystem," something hinted at in Hall's "platform churn" comments. People using services like the App Store and Apple Music, for example, may be less inclined to switch platforms, since they would lose their paid app libraries and the latter's deep OS integration. 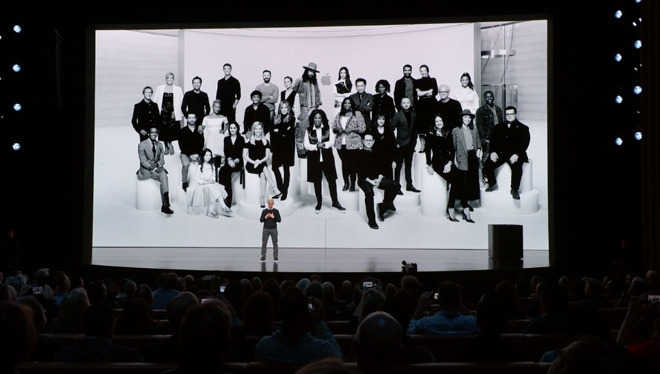 Pricing for Apple TV+, the company's original video content, is "one of the biggest unanswered questions," Uerkwitz said. The company will have to compete with Netflix which charges $12.99 for its standard plan, and Hulu, which charges $11.99 for an "ad-free" subscription. An ad-based subscription is $5.99, or completely free with an individual Spotify Premium account. Amazon Prime Video is $8.99 per month, or free with a full-fledged Prime membership, which costs $119 per year.